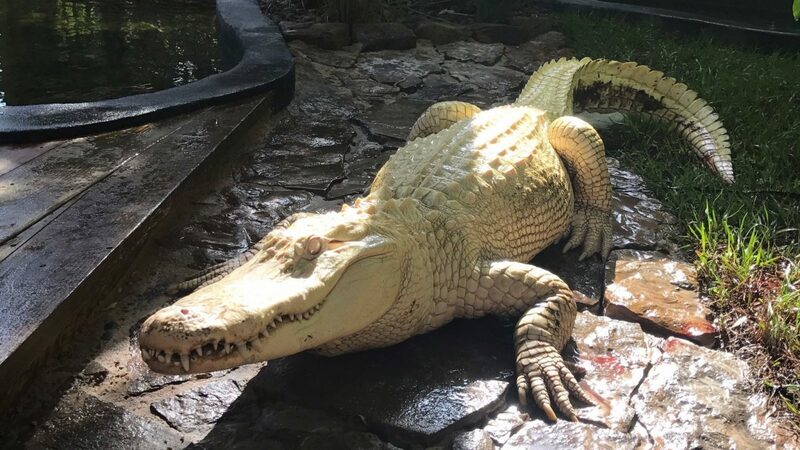 Wild Florida is thrilled to announce the arrival of two rare albino alligators to its Gator and Wildlife Park in Kenansville. The 23-year-old female and 12-year-old male were acquired from the St. Augustine Alligator Farm. This will be the first pair of breeding albino alligators in Central Florida and one of the few places in the world visitors can see these rare animals. Due to the lack of melanin this species produces, their skin is completely white and sensitive to sunlight, so a state-of-the-art, climate-controlled exhibit has been built for the pair. The addition of these gators to the park will allow the park to have the opportunity to showcase how unique gators are and further educate visitors. “We’re very fortunate to add these gators to our Wild Florida family and can’t wait for our guests to see how incredible they are,” says Sam Haught, co-owner and co-founder of Wild Florida. Admission to the Gator and Wildlife Park is free for the remainder of 2017 to celebrate Wild Florida’s 7th anniversary as well as give all visitors the chance to see these rare alligators. Wild Florida Airboats and Gator Park, which opened on Lake Cypress in 2010, focuses on educating individuals on Central Florida’s natural resources. The Wild Florida team is dedicated to protecting, conserving, and enhancing Florida’s diverse ecosystem to ensure that future generations can enjoy the wonders of wild, native Florida. For additional information, visit www.wildfloridairboats.com.